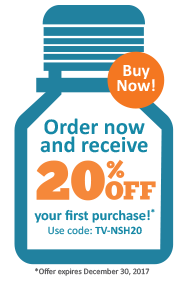 Dramatically Reduce Autofluorescence - Risk Free! 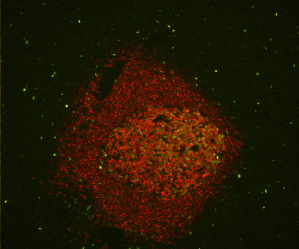 Human spleen sections (FFPE) stained using mouse anti-CD20 (red) and rabbit anti-Ki67 (green) primary antibodies detected with VectaFluor® Duet Kit (DK-8818). 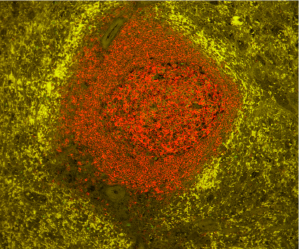 Note significant reduction of autofluorescence in the treated section (right) with retention of well-defined, specific signal in both red and green channels. Introducing…Vector® TrueVIEW™ Autofluorescence Quenching Kit – the best solution yet for removing unwanted autofluorescence in tissue sections. 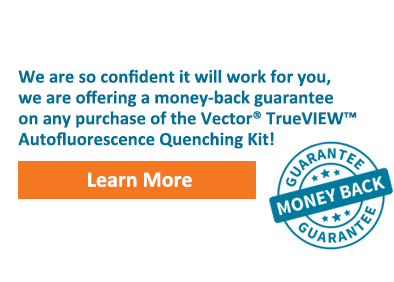 Vectorreg; TrueVIEW™ uses a unique, patent-pending quenching agent to specifically bind and quench autofluorescent elements from non-lipofuscin sources, even in the most problematic tissues. ©2017 Vector Laboratories. All rights reserved.